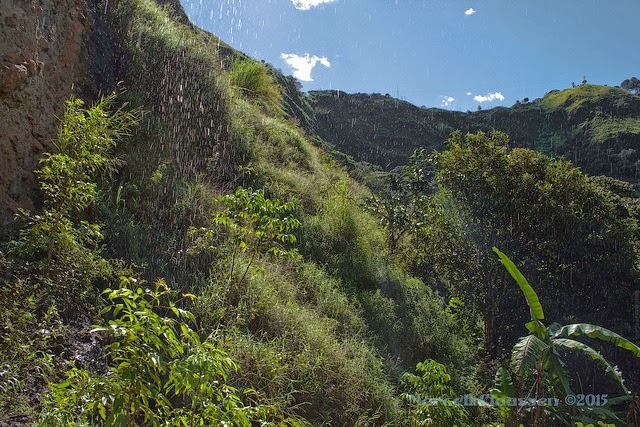 These are just some of the ingredients of a hike with a local guide on the outskirts of Chachagüí village in an area known as La Joya, and that’s excluding some steep inclines and jaw-dropping scapes. Exploring is something I can never resist and this was one of those trips; not far but the chance of getting inside some old caves and getting to know more about the local history and culture. I met up with Juan Carlos who was to be the guide and Carlos and Patricia from Hostel Kundur around 7:30am in Chachagüí. Ready for any weather changes, I had my rain gear with me but also camera with 2 lenses, binoculars and my tripod - a heavy bugger at the best of times at around 6+kg, so had a decent amount of weight for a hike/trek I didn’t know much about. But, you want the adventure AND the photos, you sometimes need work much harder! We headed off on two motos (motorcycles) about 1.5km to the northern side of Chachagüí where there are still businesses and houses along the Panamerican highway. The initial trail with cement slabs descends into the valley with a pretty decent slope and then becomes a little footpath. We’d had a bit of the rain the preceding days so there was still a bit water running down to the river, making the footpaths little slippery streams but with some care, was fine! Medicinal flower for stomach problems. "Owl" butterfly of Satyrnidae family on bananas. The trail descends through some agriculture, mostly still with remnants of old forest and some shade which was rather welcome considering how quickly it was getting hot on this particular day. Along the way we were able to refresh with some fruits and even high-potency energy with a piece of sugarcane. Soon we were at the property of Don Franco where he has a lot of coffee growing over and above the fruit and other foodstuffs. This area was all work for them but with amazing views and heaps of birds and butterflies. Mix of agriculture (coffee and bananas here) and some remnants of old forest. Following him, we passed his home and started to ascend a bit to the most accessible of the caves around his area. The final little section took a bit of a scramble and we found a small cave which is more of a refuge than anything else. Everywhere along the cliff, there was water drizzling/raining down from the saturated soil above. The flatter area at the cave was also being used to dry some foodstuffs. To see the other cave we had to descend from the smaller cave again to a spot further away from the wall where we could see the cave in the cliff face. There was no way we could get there from we were and immediately discussion ensued about descents with ropes. Apparently this cave is big although nobody present had seen what’s inside. 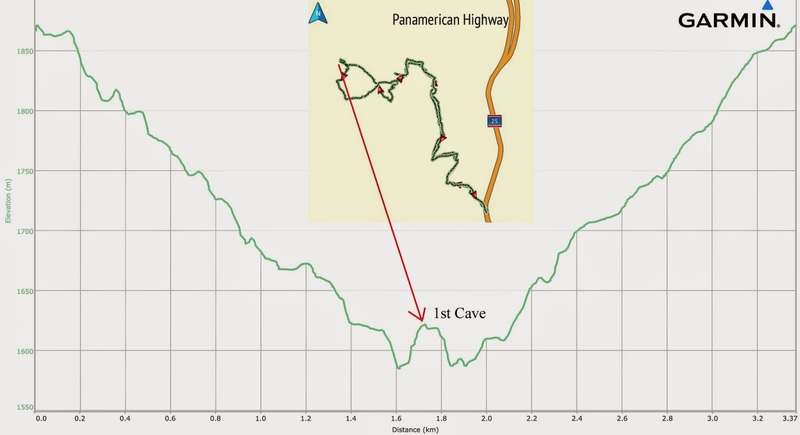 So, all in the planning now to get hold of some rope experts to accompany us for a recce of the area above the cave. We need to obviously be sure the rock is stable enough for anchors and then get a better idea of how much rope and kit we need. Then! The actual descent which will start the exploration of might turn out to be a most interesting spot! Depending on the kit available, might have to lower my bag with kit and tripod separately or something. If all’s good, there is the potential of this becoming an adventure history/culture product for tourists. 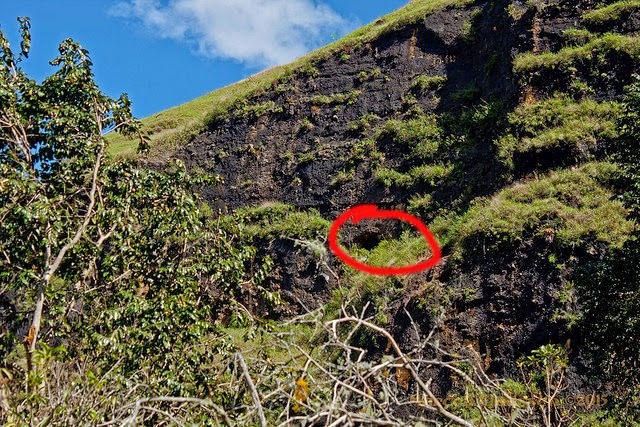 Location of the 'other' cave on fairly wide ledge; probably around 30+m rope required for the abseil down. From this spot we could also see another trail leading further down to the river, still at least another 200m (height) below us. Unfortunately, it was time to head up back out of the gorge. Excited about the prospects of more adventure waiting, we tackled the ascent which was a decent little workout especially with the amount of weight I was carrying. Panoramic view of the Rio Pasto canyon to the south (to Pasto). Galeras volcano in the centre back. I will definitely be back here exploring further down into the gorge (apparently there’s a 200m cable with a pulley too - zip-line action! Another activity waiting to be built up here in perfect topography.) and then of course with the other guys and more rope and kit to explore the other cave. Total distance: 3.37km Start elevation/altitude: 1,872m a.s.l.